When we were planning our two-week honeymoon to Mexico three years ago I was thinking about lounging around on the beach and spending a lot of together time watching sunsets, eating Mexican food and just blissfully looking into each other’s eyes. Steve, on the other hand was thinking about birding. I was a little skeptical at first, because the only birding we had really done together during our two-year long-distance courtship was when he was in Utah visiting and we went to Antelope Island or Bear River Wildlife Refuge. Those were really just day trips. We hadn’t really done any serious birding with guides in Utah. 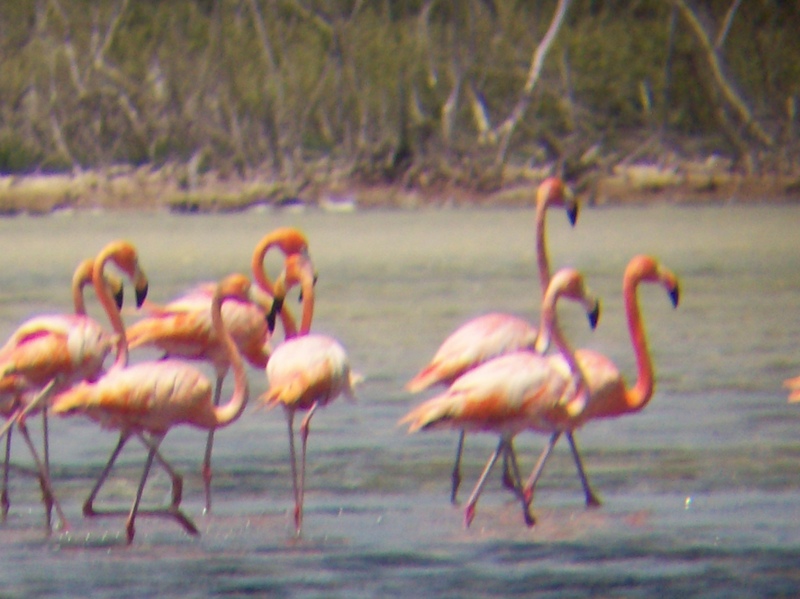 One of the most memorable birding trips was when we arose at 4:00 a.m. (yes, on our honeymoon) and drove two hours north to Rio Lagartos, a little fishing village where flamingos are known to nest. We got a little lost as we went through one of the small towns on the way to Rio Lagartos. The streets were crazy! All were one-way streets, and would you know it, all the signs were in Spanish. We eventually flagged down a taxi driver and we convinced him to let us follow him out of the town on to the main road. I gave him a few Pesos for his effort and on our way we went. 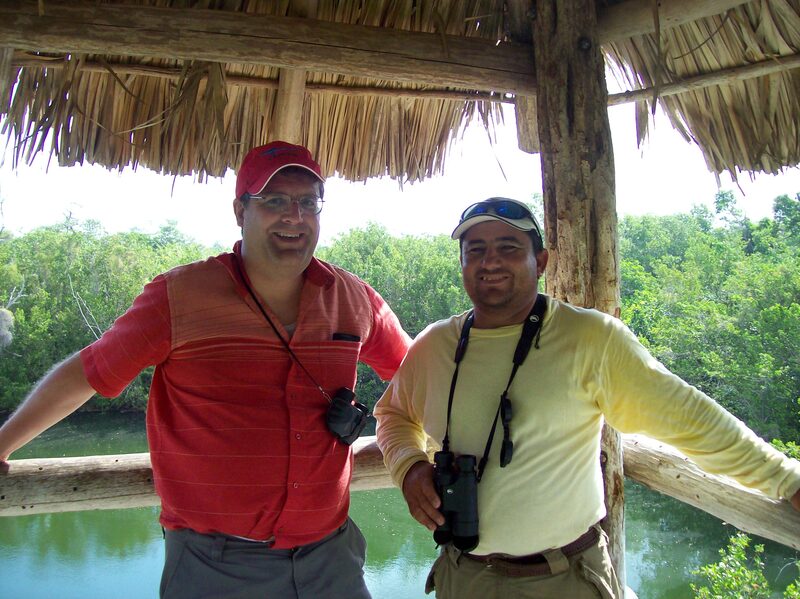 At 6:00 a.m. we arrived in Rio Lagartos and met Diego our guide. Steve had made arrangements with him before the trip to take us on a private birding tour. We saw so much! 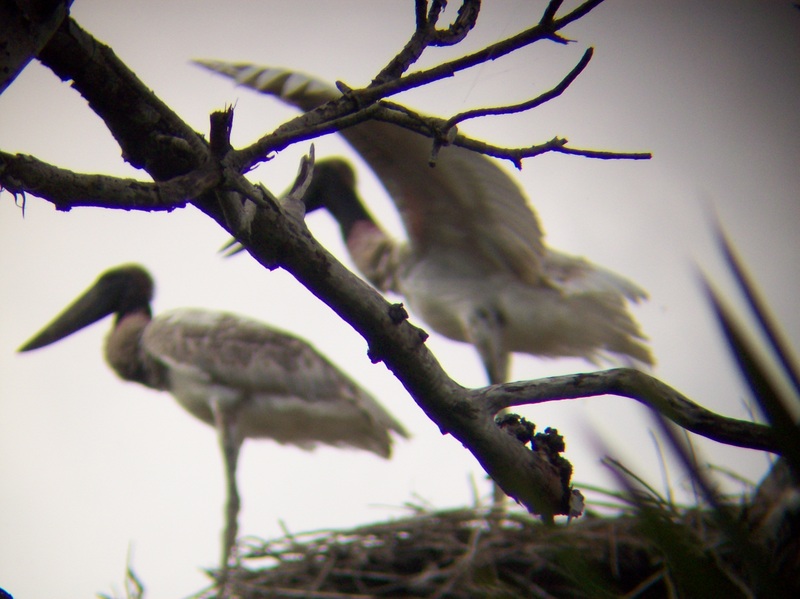 The highlight was seeing the young Jabiru storks in their nest (it was a total National Geographic moment, as I saw them practicing how to fly by flapping their wings and lifting up their spindly legs over their nest). We also saw the Ferruginous Pygmy-owl get hassled by a bevy of birds (including a hummingbird) who all wanted him to get out of town. We walked deep into the mangrove jungles and navigated carefully across broken foot bridges and I was impressed by Diego’s thoughtfulness in taking care of the precious area by picking up trash left behind by previous explorers. At lunchtime we took a break and had lunch at Diego’s family restaurant. (Yea! More chips and guacamole!) 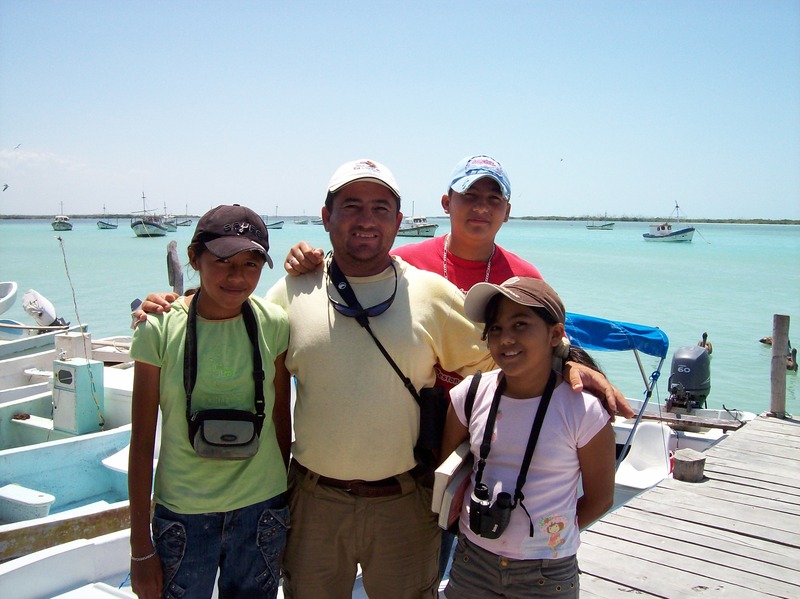 Then Diego’s son, Diego Jr., and his daughter, Andrea, and her friend joined us for a boat ride. We saw American flamingos, Roseate Spoonbills, and even a crocodile among other things. We stopped at the salt flats and played in the foamy bubbles and the mud. I just loved spending time with Diego and his family. They were so hospitable to us and at the end of our trip I didn’t want it to end. The next morning we got up not as early and took a private tour of the grounds at the Hacienda Chichen where we were staying in Chichen Itza. My favorite bird, by the way, at this place was the Melodious Blackbird. He’s like the tenor in Turandot and has a big “voice.” To watch the bird sing is fun–the bird squats down a bit to fill his lungs with air and just belts it! That’s a great hobby. I will defiantly try it – thanks a lot! I always like to hang out and watch the nature. Fishing is not my thing since i don’t like killing animals, but birding seems something I can go along with. Be sure to catch the movie, The Big Year, which opens this weekend. A movie about birding that stars Steve Martin, Jack Black and Owen Wilson.